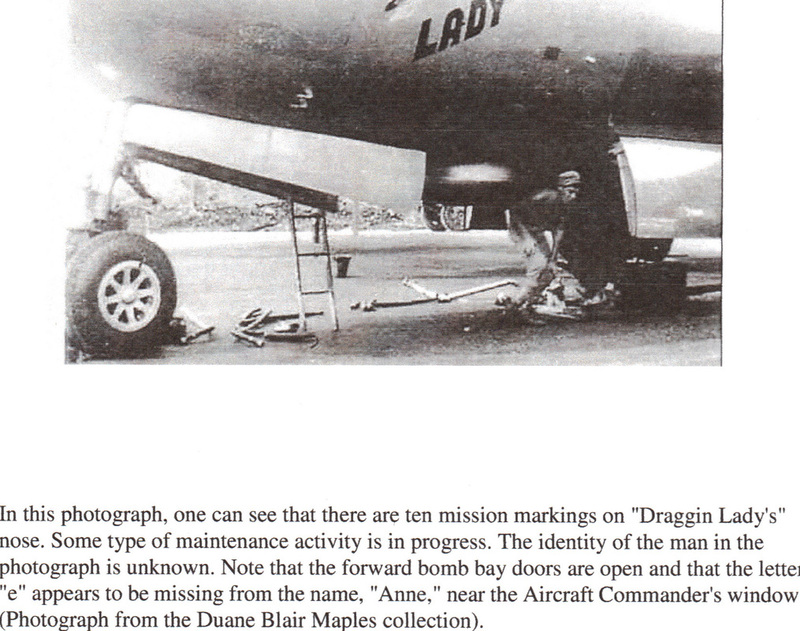 Our uncle joined Captain Richard Field as radar operator on the "Draggin Lady" on May 16th, 1944, at Victoria, Kansas. They arrived on Saipan on November 18th, 1944, and their initial mission was the first bombing of Tokyo by the 881st on November 24th, 1944. He also flew missions on November 27th and December 3rd. After the December 3rd mission, Captain Field returned to the states and Lt. Patrick Calhoun took over this crew. This aircraft flew 12 missions before it was lost off the coast of Saipan while on a slow timing flight, killing pilot Lt. Robert Engle and Lt. Glenn Pavey and an observer. Our research indicates our Uncle Bob may have flown only one mission with Lt. Patrick Calhoun, to Iwo Jima on 8 December 1944, before transferring to Major Fitzgerald's crew on the "Mission to Albuquerque". Uncle Bob joined the Fitzgerald crew ("Mission to Albuquerque"), 11 December 44.
failed and finally landed with wheels down in the ocean just inside the reef north of Kobler Field on the west side of the island. The plane almost stood on her nose and Lt. Engle and 2d Lt. Glenn E. Pavey were trapped in the nose and drowned. Of six sailors who were passengers five escaped and one (named Granach?) was killed. M/Sgt Dooley H. Rogers [probably a ground crewman] and Sgt John L. Lippa [radio operator] were wounded." Walker-Talker article 15 July 1944 The men of the B-29 crews in each squadron were drilled on this procedure regularly. According to Jim Bowman, with the B-29 remote gun sight system, it was very important to recognize the different types of enemy planes because you had to set your gun sight parameters according to the known wingspan of that type. It was also equally important to be able to recognize enemy aircraft from "friendlies." No one wanted to shoot down an escorting P-51 by mistake. The Walker Talker posted an article in the 27 May 1944 issue, announcing the opening of the Hays Pool. The opening of the pool in a small town like Hays, Kansas, was quite an event, but like the true patriots thatthey were, the citizens offered it's use to the military. See our attached newspaper article on our Uncle Boband his crew of the Z Square 6, "Draggin Lady", in the pool during "ditching" practice and procedures. Z-6, 42-24694, of the 881st Squadron, out of the hangar where she had been worked on. Towing a B-29 out of a hangar was not a simple task. The great wingspan of over 141 feet left little clearance for the hangar doors, and the tail, or vertical stabilizer, was so tall that special doors had been cut above the center of the main doors. The NCO driving the cletrac, a small towing tractor, started out all right, going slow, but once the wings had cleared the doors, he started to turn to the left too soon. This caused the tail, still inside the hangar, to move to the right and crunch into the wall of the hangar. This entry would not have been possible without Duane Maples, Craig Maples and Rich Cookson. Battle Damage to Z-6...In right photo Harry Gerson is pointing at the hole in the wing. Charles Maples is 2nd from the right. In left photo, Harry Gerson is at far left, and Charles Maples is 4th from the right. Glenn Pavey and an observer. broke his leg. Both Rogers and Lippi eventually returned to flight status. This aircraft never flew again. 16 May 44-Uncle Bob Met A/C Captain Richard Field and said he "seems like a nice fellow." 16 June 44-Flew in a severe thunder storm while training in a B -17 and had to land at another airfield. "is a really good pilot." attacks done by P-40s and P-47s. Also trained with a .45 caliber pistol. 23 Sept 44-Uncle Bob reports a friend of his was killed with his entire crew last Sunday in a training mission at Walker Field. 17 Oct 44-Left Walker Field for staging base to the Pacific at Kearney, Nebraska. 7 Nov 44-Departed Kearney, Nebraska for Mather Field in Sacramento, California. 8 Nov 44-Arrived Mather Field. 13 Nov 44-Departed Mather Field for John Rodgers Field, Oahu, Hawaii. 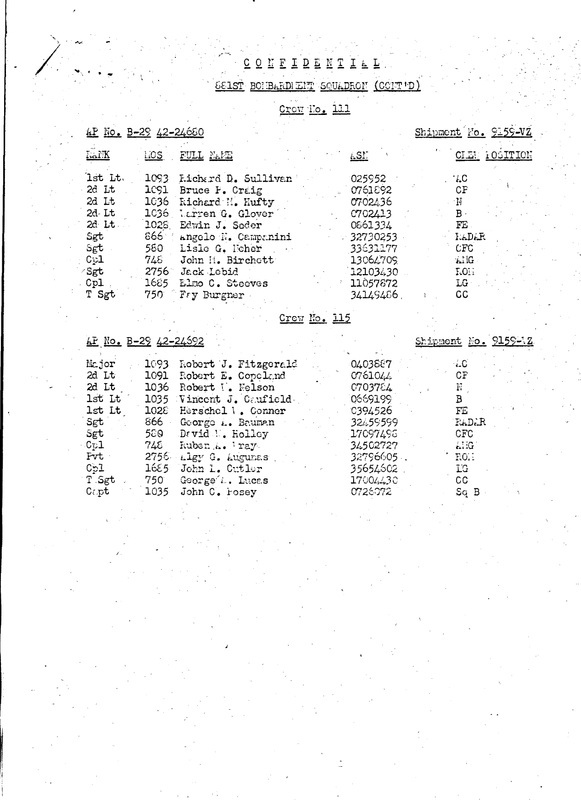 15 Nov 44-Uncle Bob was able to contact his older brother Rich on Oahu, and they spent 15 hours together including Uncle Bob showing him his B-29. At this meeting, Uncle Bob told Rich he didn't think he'd make it home if his crew ended up flying missions as the "lead" plane. 16 Nov 44-Departed Hawaii for Kwajalein. 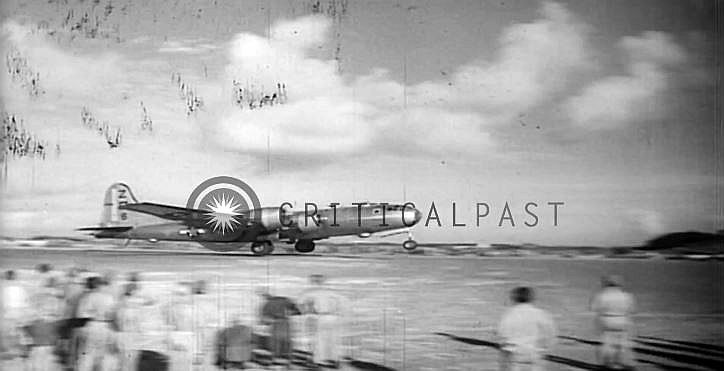 18 Nov 44-Arrived at Isley Field, Saipan. ***C. Maples & D.Bulloch said they flew "practice" missions before the Tokyo mission, but couldn't remember the dates or to which islands. Participated in the first raid against Japan from Saipan. Bombed the dock area from 29,500 feet with 8X500 lb. demolition bombs. Flight time: 13 hours, 30 min. Poor results. bombed secondary target & received credit for mission. After mission, they landed at Guam due to Japanese air attacks on Saipan. Flight time: 13 hours, 10 minutes. *Radio operator Charles Maples of Z-6 was the last man to hear from the badly damaged aircraft Z Square 2 and the Irvin crew, which were never found. See the full report on this incident on the Charles Maples page. 3 Dec 44-Target: TOKYO and Target # 357. Again had to abort 30 minutes prior to reaching the IP because of a "blown stack" in engine #1 and did not receive credit for this mission. Upon return to Saipan,Capt. 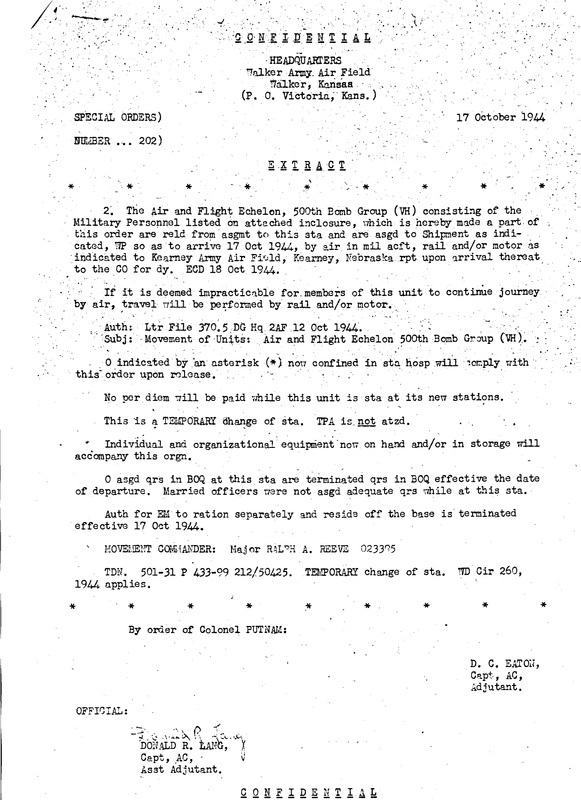 Field was medically evacuated to Hawaii and returned to the U.S.
**Uncle Bob also wrote home about the loss of the lead crew on this mission, which was that of Major Robert Goldsworthy flying Z Square 1, the "Rosalia Rocket" over Tokyo. Also lost on the Z-1 were Colonels King and Brugge. Flight time: 12 hours, 15 minutes. 5 Dec 44-Flying on Z Square 4, "Black Magic" with Major Luman, the crew of "Draggin Lady" went on a search mission between Saipan and Iwo Jima to try to find the crewof Capt. Irvin and the Z Square 2. No traces were ever found. Flight time: 9 hours, 0 minutes. 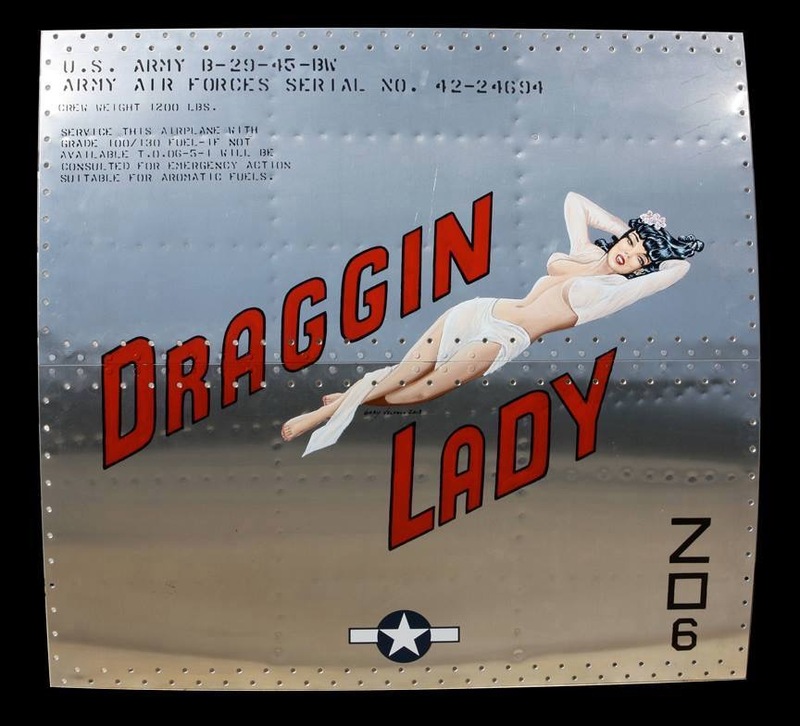 6 Dec 44-Lt. Patrick Calhoun becomes the new A/C of the "Draggin Lady", much to the chagrin of the crew who felt Richard Dodds should have gotten the position. 8 Dec 44-Practice mission to: IWO JIMA. 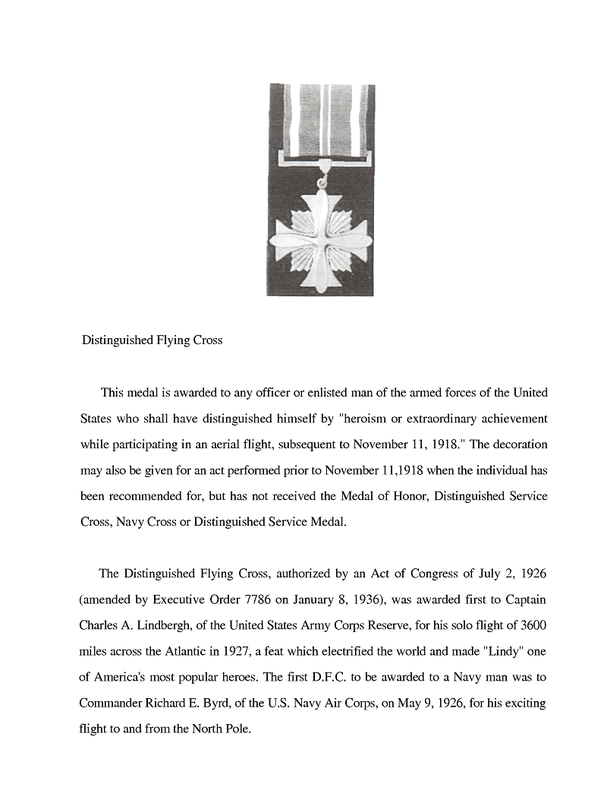 as deputy lead aircraft. Uncle Bob bombed the target successfully with radar after lead crew radar operator on Fitzgerald aircraft missed the island entirely. 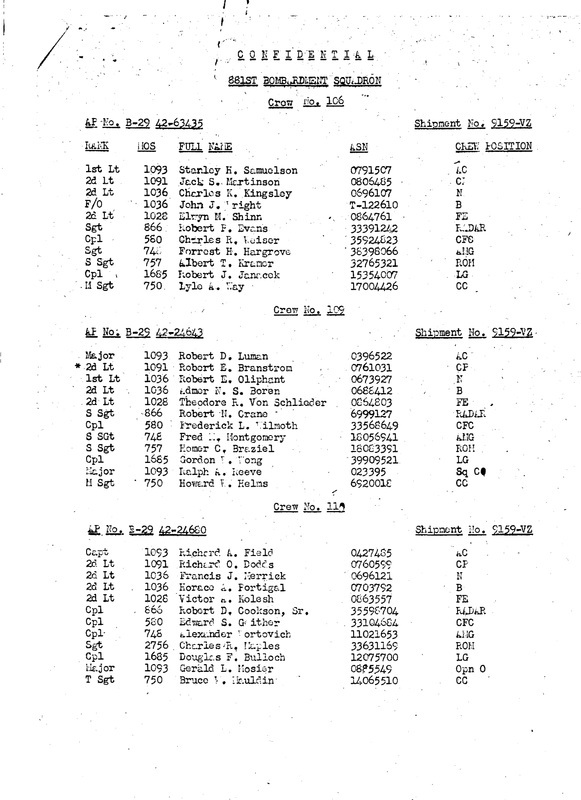 10 Dec 44-Robert Engle crew # 105A arrives on Saipan as replacements for the Irvin crew. 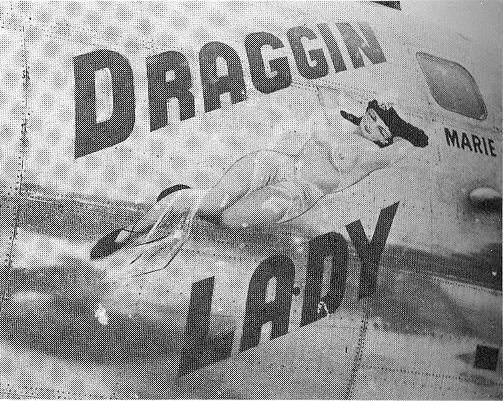 As replacements, Engle and his men became the secondary crew on "Draggin Lady." 11 Dec 44-For his successful work on the Iwo Jima mission, our Uncle Bob is selected by Major Fitzgerald to be his new radar operator on the Z Square 8, "Mission to Albuquerque". He would be missed by his old crewmates on Z-6 but was replaced by an excellent radar operator, Harry Gerson. Engle and his crew flew this mission. Per tailgunner Raymond Rendina, the bomb rack malfunctioned and they had to make two passes over the target. A/C finally jettisoned the bombs using a screw driver. 25 Dec 44-Target: WSM #59-NAGOYA. Calhoun and crew flew the Z Square 9, "Nina Ross". Had to bomb Chichi Jima by radar instead of primary target because of a stuck valve in the top bomb bay tank. winds (jet stream) had to bomb the secondary target with minimal results. engine #1. Engine leaking oil badly and smoke and sparks trailing wing. Prop finally broke loose and control was regained of the aircraft over the Pacific, but not before the crew thought they would have to "ditch." Calhoun and crew drop demolition bombs on the Kawasaki-Akashi Aircraft plant with excellent results, but received three flak hits to their aircraft. Co-Pilot Richard Dodds flew the bomb run. Flight time: 15 hours, 5 minutes. Engle and crew flew this mission, but aborted due to a fuel transfer system failure. No credit for mission. Calhoun and crew flew this uneventful mission. Flight time: 14 hours, 15 minutes. 2 Feb 45-Radio Operator Charles Maples was sent to Tinian to speak to new crews about their responsibilities during missions. 7 Feb 45-Target: Practice bombing mission PAGAN. Flown by Calhoun and crew. 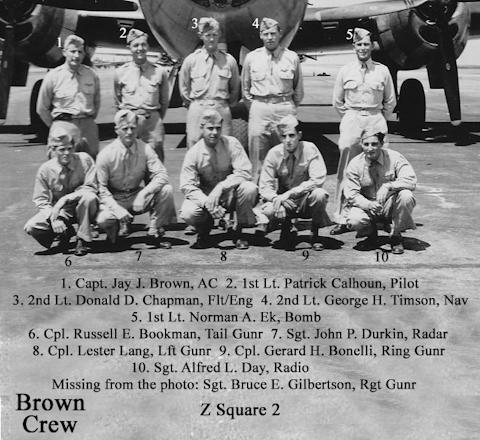 Calhoun and crew flying Z Square 7, "Hell's Belle" on this precision bombing mission. BUT, parked on the hardstand next to the Z Square 12 prepping their airplane, the Z-12s rear lower gun turret malfunctioned and began firing rounds across the runway. The Calhoun crew all hid behind the landing gear or a truck parked nearby. Luckily no one was injured. Flight time: 15 hours, 25 minutes. 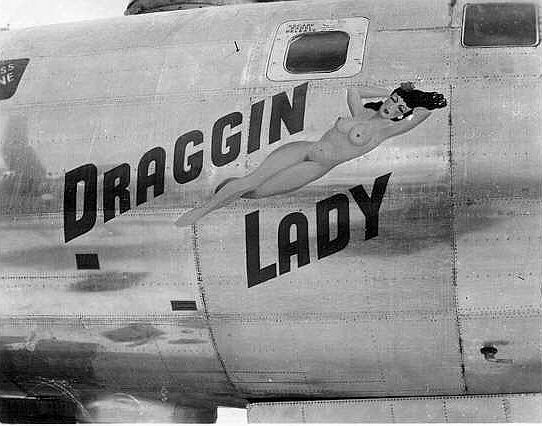 * Engle and crew flew "Draggin Lady" this mission and bombed from 29,000 feet with a mix of demolition and incendiary bombs. Engle and crew again aboard the "Draggin Lady." Tail gunner Raymond Rendina was hit and almost killed by fire from an enemy fighter's 20mm cannon. Only the quick thinking by A/C Engle and Sgt. Lester Thomas saved his life, but he would not fly again. 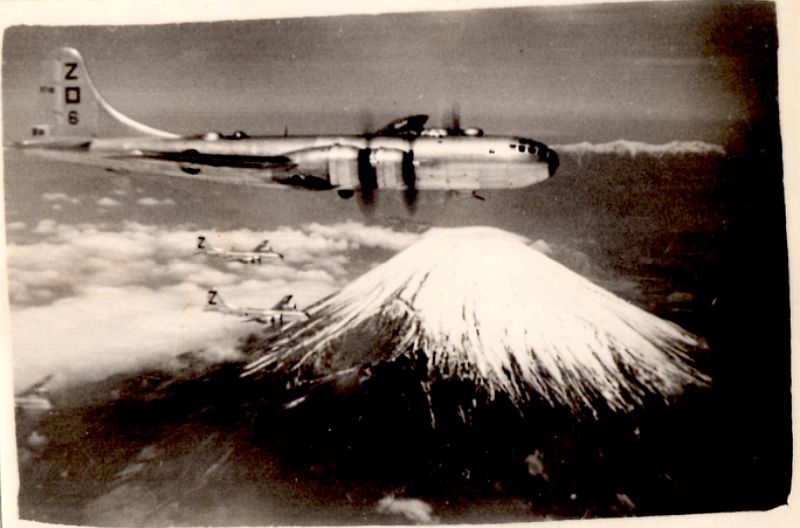 demolition bombs at 28,000 feet But, heavy cloud cover over target forced the B-29s to divert to and bomb the dock area of Tokyo. Over 200 fighter attacks. **Left gunner Doug Bulloch was credited with one probable Irving downed. Blew 2 tires on right side when landing on Saipan upon return, and aircraft ground looped. Flight time: 15 hours, 20 minutes. Co-Pilot Richard Dodds, they got between a badly damaged B-29 and the Japanese fighters attacking it, and warded off the attackers. 23 Feb 45-A sad day. 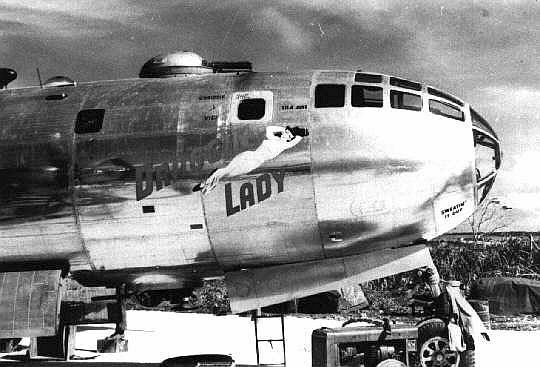 The "Draggin Lady" was lost today after engine and mechanical problems caused her to crash off the coast of Saipan while on a slow timing procedure. F.E. Dooley Rogers and Radio Operator John Lippa were severely injured. The aircraft was a total loss. PLEASE MOVE TO OUR "BOOZE HOUND" PAGE. BOOZE HOUND REPLACED "DRAGGIN LADY" AS THE NEW Z SQUARE 6.